Jillian Infusino had been to the White House before, but this time was different. This time she was meeting the president of the United States. Jillian, who is the National Venturing Vice President, was part of a Scouting delegation that presented the 2014 Report to the Nation to President Obama on Wednesday. In spite of her monumental responsibility, Jillian said she felt pretty relaxed as the group proceeded through security, toured the East Wing and waited in the Oval Office reception room. Then an aide said it was time, and it hit her. “When we got in line and starting walking down, it was like, oh man, we’re really going to do this now,” Jillian told me. Obama opened the door himself, and Jillian saw our 44th president standing in front of her. Obama asked each Scout and Venturer where they were from and welcomed them to the White House and the Oval Office, Jillian said. The significance of that moment wasn’t lost on her. She said the Oval Office was smaller than she was expecting and that its doors blended in to the walls when closed. Ryan, 7, one of the Cub Scout representatives, turned to Jillian and asked where the door had gone after Obama closed it. “It’s there. Don’t worry,” Jillian told him. As you probably remember, the BSA sent a Report to the Nation delegation to Washington, D.C., last month. 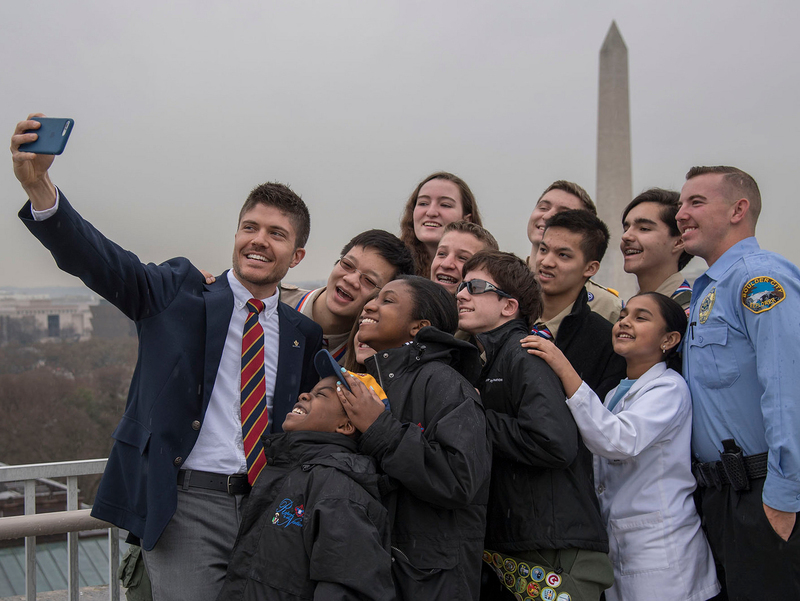 The Report to the Nation trip is scheduled far in advance, so the president isn’t always there during the BSA visit. Sure enough, Obama was traveling while the BSA delegates were in town in February. So the BSA was told Obama would try to welcome them another time. The call came in early March, and two weeks later Jillian and her fellow delegates were meeting the president. Jillian said the leader of the free world seemed personable and eager to meet the Scouts. The delegates presented him with the 2014 Report, his official 2015 membership card as honorary president of the BSA, a Report to the Nation coin and a campership so an underprivileged Scout can spend a week at the Summit Bechtel Reserve. Jillian got to present the campership to him. Obama had stuff to present the delegates, too. He gave them a bag including Obama yo-yos, presidential M&Ms, a White House sticker, a presidential coin, and a Bo Obama photo with facts about the dog. It all was over in about 10 minutes, but those were 10 minutes Jillian and the Scouts will never forget. Jillian said the group had a brief conversation with Sylvia Mathews Burwell, the U.S. Secretary of Health and Human Services. Burwell, who had just met with Obama herself, told the group she has a 7-year-old daughter and a 5-year-old son who are getting ready to join Girl Scouts and Boy Scouts. Jillian Infusino, Silver Award recipient and the National Venturing Vice President. Peter Schmidt, Eagle Scout, Quartermaster Award recipient and the National Sea Scout Boatswain.